Example-1 :- Find the term independent of x in the expansion of (3x2/2 - x/3)6. Example-2 :- If the coefficients of ar-1, ar and ar+1 in the expansion of (1 + a)n are in arithmetic progression, prove that n2 – n(4r + 1) + 4r2 – 2 = 0. The (r + 1)th term in the expansion is  nCrar. Thus it can be seen that ar occurs in the (r + 1)th term, and its coefficient is nCr. Hence the coefficients of ar-1, ar and ar+1 are nCr-1, nCr and nCr+1, respectively. 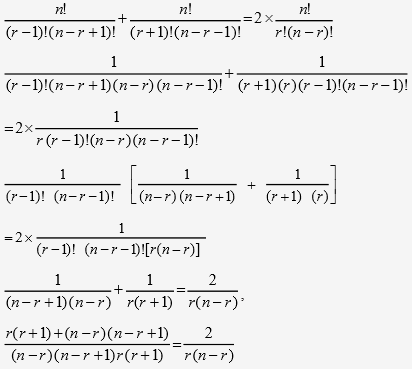 Since these coefficients are in arithmetic progression, so we have, nCr-1 + nCr+1 = 2.nCr. Example-3 :- Show that the coefficient of the middle term in the expansion of (1 + x)2n is equal to the sum of the coefficients of two middle terms in the expansion of (1 + x)2n-1. As 2n is even so the expansion (1 + x)2n has only one middle term which is (2n/2 + 1)th  i.e., (n + 1)th  term. The (n + 1)th term is 2nCn xn. [(2n-1+1)/2 + 1]th i.e., nth and (n + 1)th terms. The coefficients of these terms are 2n-1Cn-1 and 2n-1Cn, respectively. Now, 2n-1Cn-1 +  2n-1Cn = 2nCn      [As nCr-1 + nCr = n+1Cr]. as required. Example-4 :- Find the coefficient of a4 in the product (1 + 2a)4 (2 – a)5 using binomial theorem. 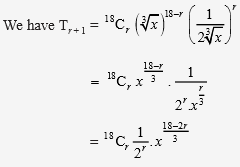 We first expand each of the factors of the given product using Binomial Theorem. = 1 + 4 (2a) + 6(4a2) + 4 (8a3) + 16a4. The complete multiplication of the two brackets need not be carried out. We write only those terms which involve a4. This can be done if we note that ar. a4-r = a4. Thus, the coefficient of a4 in the given product is – 438. Example-5 :- Find the rth term from the end in the expansion of (x + a)n.
There are (n + 1) terms in the expansion of (x + a)n.
(n + 1)th term of the expansion and n + 1 = (n + 1) – (1 – 1). The second term from the end is the nth term of the expansion, and  n = (n + 1) – (2 – 1). The third  term from the end is the (n – 1)th term of the expansion and n – 1 = (n + 1) – (3 – 1) and so on. Thus rth term from the end will be term number (n + 1) – (r – 1) = (n – r + 2) of the expansion. And the (n – r + 2)th term is nCn–r+1 xr-1 an-r+1. We get r = 9. Example-7 :- The sum of the coefficients of the first three terms in the expansion of (x - 3/x2)m , x ≠ 0, m being a natural number, is 559. Find the term of the expansion containing x3. The coefficients of the first three terms of (x - 3/x2)m are mC0, (–3) mC1 and 9 mC2. which gives  m = 12 (m being a natural number). Since we need the term containing x3, so put 12 – 3r = 3 i.e., r = 3. Thus, the required term is 12C3 (–3)3  x3,  i.e., – 5940 x3. Example-8 :- If the coefficients of (r – 5)th and (2r – 1)th terms in the expansion of (1 + x)34 are equal, find r.
The coefficients of (r – 5)th and (2r – 1)th terms of the expansion (1 + x)34 are 34Cr-6 and 34C2r-2, respectively. So, we get r = – 4 or r = 14.
r being a natural number, r = – 4 is not possible.